In my last post I shared my first Sewaholic Renfrew with you, there’s no doubt that this pattern has now become a firm favourite of mine – I’ve made many, many different versions. 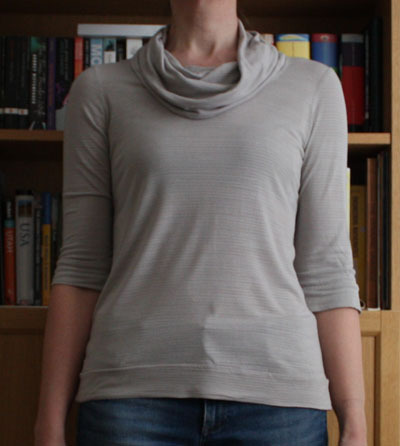 In this post I’d like to share the cowl neck Renfrews I’ve made. This neck line option was a big part of why I was drawn to the pattern in the first place and it also turns out to be the easiest of the necklines to sew, win! 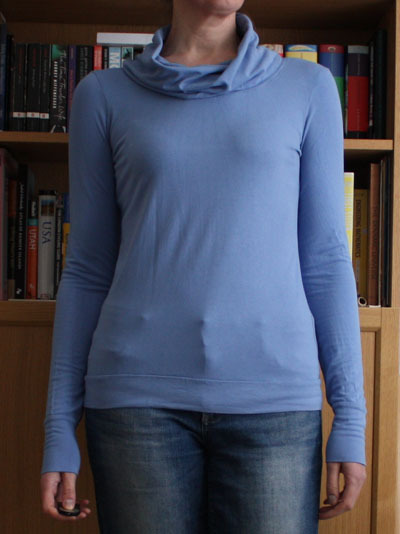 First up was this 3/4 length sleeve version using a lightweight cotton jersey. It looks like a solid colour from a distance, but up close you can see narrow stripes with a bit of sparkle. 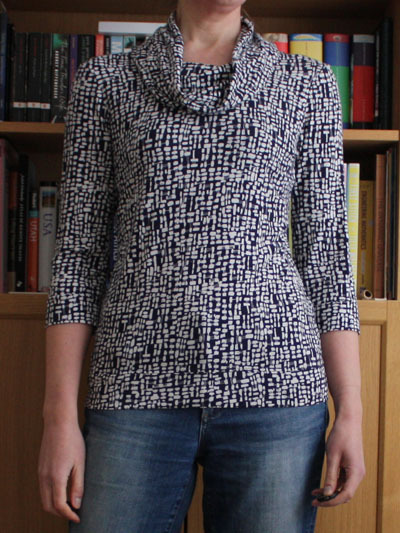 I then moved on to a couple of long sleeve versions in solid colour viscose jerseys. These have proved perfect for work etc as they have a more dressy look than regular jersey tops but are still super comfy! 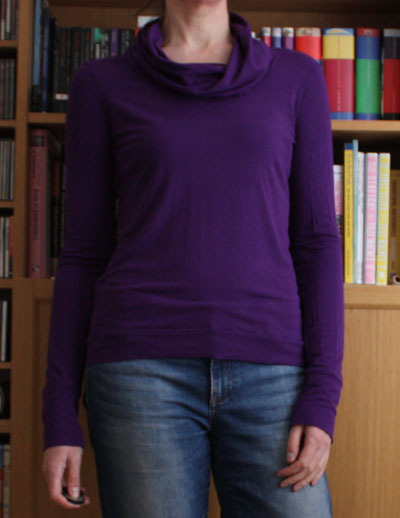 For the purple one I changed the sleeve cuffs a little more so that they are wider over the hand than at the wrist. This feels pretty perfect to me now as the cuff contours nicely over my wrist and hand. The slightly wider diameter at the end also works very well if I get a bit warm and want to turn up the cuffs. And more recently I’ve made a couple more of the 3/4 sleeve variety, lengthening the sleeve a bit for these as the cuff on the first one can get a little uncomfortable sitting right on my elbow. I only made these last autumn so they haven’t had a lot of wear yet as it is rare that I don’t go for long sleeves in the winter, but I’m looking forward to wearing them more now that spring is on its way. These 2 were made with better quality fabric than the others – as I’ve gotten more confident with my sewing I am now happy to pay more for fabric as I want my garments to last. The navy and white is a lovely soft viscose from Sew Over It, doesn’t look like they have it any more I’m afraid (it had been in my stash for a while). The stripey one is a modal from Guthrie and Ghani – I’d not sewn with modal before, but boy am I converted – this is exceptionally soft. So that’s my collection of cowl Renfrews, nearly enough for each day of the week! 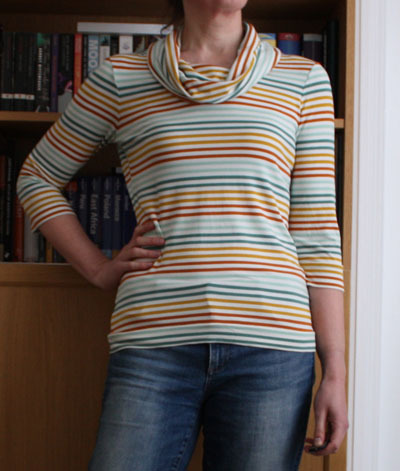 Not so many bloggers talk about the Renfrew pattern any more, but I still love it and consider it my default t-shirt and jersey top pattern. Have you made any Renfrews? Or do you have another favourite pattern that was released years ago but that you still keep reaching for?